The moon is always circling the Earth and has always been a favorite photo subject. It has also been a frustrating photo subject for many photographers. Our photo lesson will show you how to easily take great moon photos. Once you have read the lesson, take some time to browse the moon pictures submitted by our About Photography readers. Photographing the moon isn't difficult but it can be tricky for new photographers. This lesson will show you how to easily photograph the moon. Photographing a landscape with the moon is very simple. There are just a few basic changes to your techniques from photographing the moon alone to get the shot you want. When dealing with buildings, ships, and other objects in front of the moon there are some basic rules to get that perfect shot. While you can take good pictures of the moon with a 300mm lens, a longer lens will help you fill the frame with the moon. However, extremely long lenses are expensive so we can turn to a less expensive alternative and take moon photographs through a telescope. Yes, telescopes can be very expensive as well but good results can be achieved with a cell phone, an inexpensive telescope, and a bit of patience. Once you've taken a moon picture, you'll need to develop the photo. 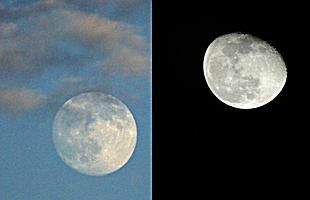 If you use digital editing there are two basic steps to making your moon pictures shine.